Data Ports For Ethernet Connection And Bandwidth Sufficient To Support Simultaneous Videoconferencing And Webcasting. And Pool; State Capitol; Lbj Presidential Library; 6Th Street Entertainment District; Long Center For The Performing Arts; Blanton Museum Of Art; And Bob Bullock Texas State History Museum. 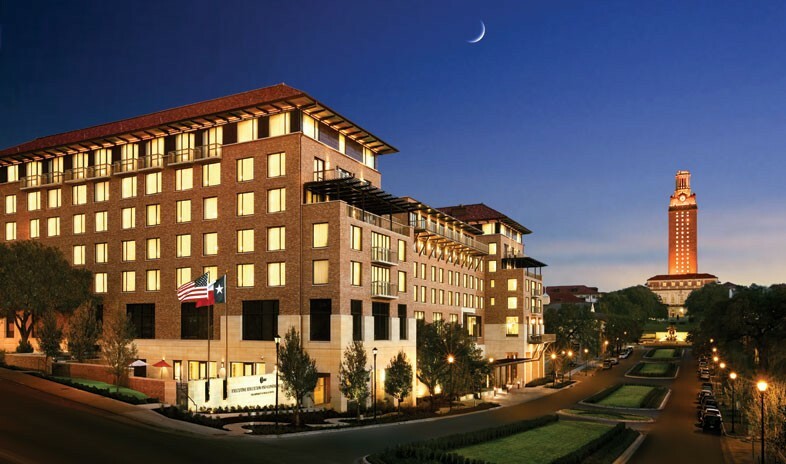 AThe AT&T Executive Education and Conference Center welcomes groups to downtown Austin and the flagship campus of the University of Texas. Certified by IACC, recipient of the Pinnacle Award, and well experienced at serving academia, business, government, and culture, the center offers a Texas-sized 80,000 square feet of function space. Its 51 meeting rooms include tiered and flexible-configuration classrooms, a 300-seat multimedia theater with giant video wall, cutting-edge Telepresence Room for virtual meetings, and an easily divisible 10,000-square-foot ballroom. AT&T’s next-generation technology includes laser projectors for the highest quality presentations; and the coming attractions include another 15,000-square-foot ballroom by early 2018. Meanwhile, the center’s boutique-style, AAA Four-Diamond Award-winning hotel follows the culinary seasons in everything from group dining to its restaurants: Carillon, Gabriel’s, and One Twenty 5 Café. The hospitality goes on to include 297 newly renovated guest rooms and suites, warm and attentive service, and an engaging atmosphere for business and socializing with colleagues. Complimentary Wi-Fi throughout the property keeps communications going. The location places delegates just minutes from Austin’s lively restaurant scene—not to mention the nearby government buildings, museum district, and entertainment zone widely known as the world capital of live music. Between adventures, explorers can easily dash home to relax and unwind. They did a spectacular job of keeping up with us. Everyone was easy to work with and the food constantly got high marks. We host our biggest event of the year at the AT&T Center, and as we've grown, they have done a spectacular job of keeping up with us. Everyone there is easy to work with – from pre-planning to fulfilling the on-site needs of our guests. The food constantly gets high marks from our attendees – the menu is elegant but simple, there's something for everyone, and you simply cannot compare it to any other conference venue or hotel's food. It's also great to be on The University campus and our guests love being right in the middle of Austin when they come to our annual event. We have used the AT & T Center several times to host our Leadership Conferences, and of course the facilities are top-notch. What really makes this location stand out is the staff—these are people who almost never say no, and are absolutely unflappable when it comes to last-minute changes and/or problems. And the food quality is way above what one would normally expect at a Conference hotel. 4 enthusiastic thumbs up from us! This hotel has not yet been rated (be the first) but it does have 3 reviews from planners.